Looking to build your future with a thriving company and work with some of the best in the industry? Look no further. 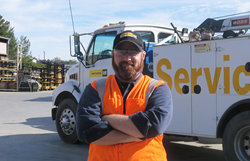 Hawthorne Cat, the exclusive Cat® equipment dealer in San Diego, the Hawaiian Islands and the Pacific Region, announces a new online career portal that makes searching for job openings faster and easier. The interactive web page is available across mobile platforms and allows users to quickly view all open positions or search by keyword, category, or location. Browse numerous available roles, including a Service Clerk at the San Diego headquarters, Technicians in Hawaii and Guam, a Rental Sales Representative in Chula Vista, and Yard Person positions at multiple locations. Headquartered in San Diego, Hawthorne Cat employs over 400 employees worldwide with locations in San Diego, Hawaii, Guam, American Samoa, and Saipan. Qualified applicants have the opportunity to join a diverse team of professionals and work with Caterpillar® - the world’s leading manufacturer of construction equipment and diesel and natural engines. Visit Hawthorne Cat Career Portal or call 800.437.4228 to learn more.